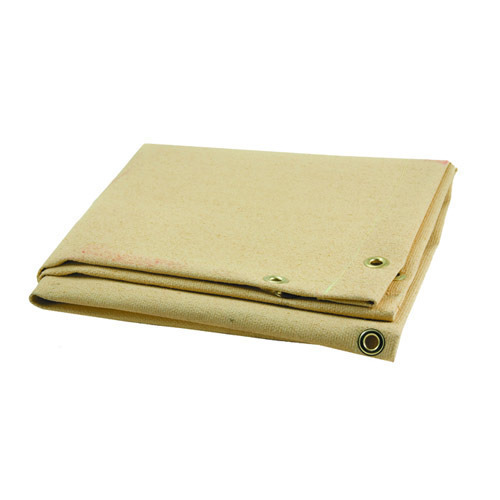 It is used as Welding Blankets and insulation lining to protect sensitive machineries, Its light and heat treated satin weave pattern results in thicker, heavier and stronger fabric far more resistance to heat impact from welding sparks as compared to other thinner, texturized cloths. Since our establishment, we are engaged in providing a comprehensive range of ASBESTOS HEAT RESISTANT HAND GLOVES & ASBESTOS COMMERCIAL QUALITY HAND GLOVES , KEVALAAR/ PARA ARAMID GLOVES , PVC & HDPE Industrial Helmet, Fireman Helmet, Safety Helmet With Head Lamp, Welding Helmet, Asbestos Safety Shoes, Gumboot, Safety Shoes, Antistatic Shoes, Nitrile Hand Gloves, Neporene Rubber Hand Gloves, Hand Safety Cuff, Face Shield, Industrial Face Shield, Clear Tough Polycarbonate Spectacles, Chemical Splash Goggles, UV Protected Goggles, Protective Goggles, Ear Muff, Ear Plug and Industrial Ear Muff. All our products are designed in accordance with national and international quality standards. Our range of equipment is manufactured using quality raw material, which is sourced from trustworthy vendors of the market. These are extensively used in various industries such as chemical, petrochemical, construction and ship building. Our modern infrastructure enables us to maintain a rapid rate of production to fulfill the bulk orders placed by our clients. Moreover, our team of experts helps us to export our equipment to Indian Subcontinent, East Asia, South East Asia and Middle East. Our wide distribution network enables us to deliver our range of equipment to our clients within the stipulated time frame.